"It's a technical astonishment. You've got to see it on the biggest, loudest screen imaginable. Shell out the extra money for IMAX. I know you usually hate 3D, but you've got to see it in 3D. It was designed for 3D and it's astonishing. Yeah, the story and script and really simple, but that's kind of the point. It's supposed to be straightforward!" Choose either 2009 or 2013. 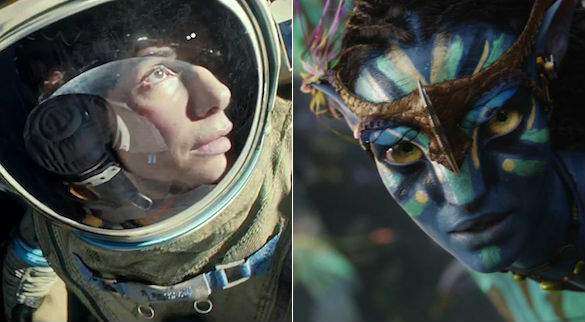 We're talking about James Cameron's Avatar or Alfonso Cuaron's Gravity. Take your pick. Of course, there's a seemingly huge gap between the films. Gravity is a critically acclaimed darling. It's a game changer, the blockbuster that will surely change the way that studio movies are made. Audiences love it. Critics love it. Everyone, including this column, have fawned over Cuaron's astonishing technical direction and embraced the simplicity of the (admittedly barebones) screenplay. Meanwhile, Avatar has seemingly fallen from its perch, reduced from the highest grossing film of all time and serious Oscar contender to a bit of an Internet joke. People roll their eyes at it now. In some ways, it's troubling to look at the gushing over Gravity. The current enthusiastic reaction is so similar to how people reacted to Avatar four years ago that you can't help but wonder when the other shoe will drop. How long until people decide Gravity's brutal straightforwardness is hokey? How long until unrealistic distances between space stations becomes the new unobtainium? How long until the 3D and the technical achievements stop being impressive and people dismiss Gravity, embracing the next big technical accomplishment while writing off the work of Cameron and Cuaron? But a series of hypothetical questions really doesn't help, does it? Gravity is an incredible movie and a wonder to behold on the big screen. So was Avatar, at one time. Naturally, the only thing to do is to revisit both films and try to figure out how much these films really have in common outside of the identical critical reaction and audience enthusiasm. First of all, it's an immediately unfair challenge. Gravity is still in theaters, where it belongs, and Avatar is currently only available on your home TV, where it's incapable of shining like it did on the big screen. Both films are built to be spectacles and as much as people like Gravity, it's easy to imagine it losing a significant chunk of its power when watched at home. Like Avatar, it was built to surround you and transport you. That's easy in a theater, but hard at home, where your screen is small and your cats are being annoying and your Twitter @-mentions keep on buzzing. It's entirely possible that future audiences will revisit Gravity on Blu-ray and wonder what the big deal was. After all, that's how people react to Avatar if they missed it in theaters. Still, after revisiting both films, Gravity definitely feels like the better movie. It's lean, with its utter simplicity focused on telling a story that's as direct and flab-free as possible. It's technology is utilized to perform camera moves and compositions that would otherwise be completely impossible. It's leading performance is raw and honest through the cliches. In comparison, Avatar is lumbering and silly, a gorgeously made by thoroughly conventional film in terms of storytelling and characters. Sam Worthington is no Sandra Bullock. Ninety minutes is far more agreeable than 180. There will come a time when Gravity will lose its luster. People are going to pick at it for years and someone is going to make a "Everything That's Wrong with Gravity" video and all of the YouTube commenters will agree that the movie is overrated and dumb. Perhaps that's just the fate of movies as ambitious as Avatar and Gravity -- someone has to pave the way, but the studio compromises you make to obtain your budget are always going to hurt your legacy in the long run. You break new ground and then you're the sacrificial lamb. You become the king and then your followers assassinate you for the little flaws that were obscured by your big message. Gravity is an important film, but so is Avatar. The important thing is that we recognize the power of time and place. To remove context from these movies is to ignore why we fell in love with them in the first place.